If you are arriving at part III first, check out the first two parts. I finally got around to demonstrating this project. It has been a long time in the making. 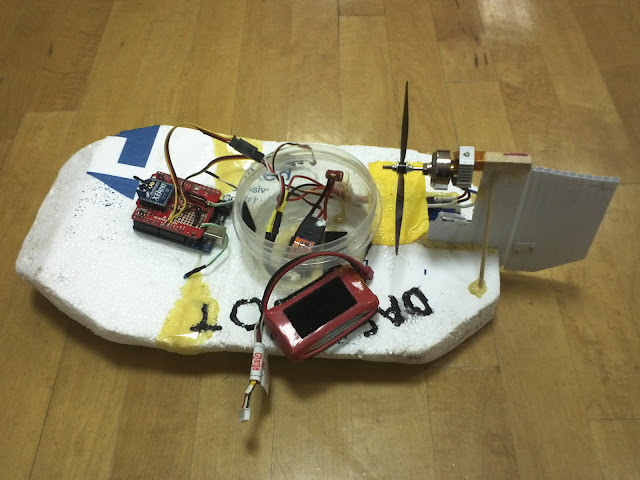 Throwing an Arduino with an XBee shield onto my homemade RC boat, Das Boot seemed like the simplest method to demonstrate the 'XBee Enabled Joystick'. The setup is the same as before in the first two parts. I only changed the sample rate on the joystick XBee to 0x021, which translates to 33ms, or about 30Hz. Below you can find sample code I used to demonstrate this project. I'll admit, the code was quick and dirty, but demonstrates some principles of parsing the XBee sample packet. My mother-in-law decided to give my son an Invincible Tornado for his birthday. Looks like a fun little R/C car. Unfortunately, there are 2 versions. One version (the version we got) plays annoying loud music when powered on. My mother-in-law warned me about this, and suggested I do what I know how and mute it with my electronics know-how. I'll be going through the steps for anyone else with aching ears. First, remove the 3 screws on the top of the vehicle. The screw on the front is covered by a sticker that can be peeled back. I finally finished my Turnigy 9X Antenna Hack video! This moves the antenna to the wireless module, making it possible to completely remove the wireless module. The video is a little long, enjoy! Every now and again I re-install Ubunutu and have to figure out how to re-install Handbrake and the DVD decryption. Just a disclaimer, the legality of this is suspect, and this should only be used to make back-ups of DVDs you own. Blah blah blah. Be honest. The following instructions come from Medibuntu documentation and Handbrake Ubuntu Installation instructions and work for me on Ubuntu 11.04. Install Handbrake. There is a handy Ubuntu PPA, which has the most recent Handbrake builds. and you can read encrypted DVDs! Hooray!